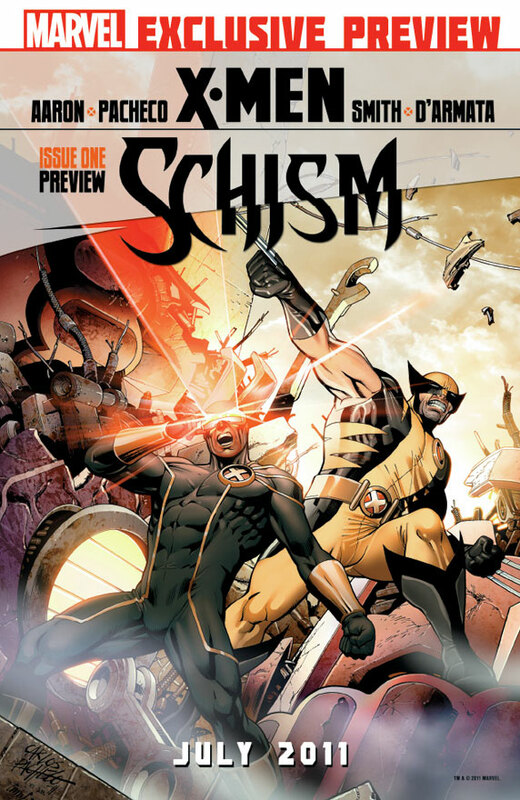 Prepare for a high octane, action packed epic that X-Men fans have been demanding as Marvel Architect Jason Aaron teams with superstar artist Carlos Pacheco for X-Men: Schism #1! For years Wolverine and Cyclops fought side by side, protecting the ideals of peaceful co-existence between human and mutantkind. But when a mutant-triggered international incident goes mainstream, their differences on the battlefield will prove to be too much and fans will bear witness to the fight they’ve all been waiting for – CYCLOPS VS. WOLVERINE! Find out as the biggest X-Men event in years kicks off this July when Carlos Pacheco, Frank Cho, Daniel Acuna, Alan Davis & Adam Kubert join Jason Aaron for the X-Ride of your life! It all begins in the oversized X-Men: Schism #1 so hold on to your hats True Believers, because when the dust settles – you’ll be wondering if Cyclops has finally gone too far . Wolverine return to Utopia after a long night. Before he can sleep Cyclops takes him to a UN meeting as his lone bodyguard. During Cyclops speech Kid Omega shows up and causes a scene. Thing escalate and Cyclops and Wolverine are attacked by Sentinels. They defeat them and return to uUtopia to rally their troops. They watch as every UN nation starts mobilizing their sentinels. At killgore industries Father Killgore is killed by his son who now assumes control of his company. He is then made King of the Hellfire club after effectively creating a situation to exterminate mutants. Cover- The standard cover shows Wolverine and Cyclops fighting side by side against an army of Sentinels. Very fitting for a first issue since both are still on the same page in this first issue. The second cover shows wolverine cutting through a picture of the united X-men, very symbolic of Wolverine literally destroying mutant unification on Utopia. Childhood- Wolverine and Idie have the best moments this issue with Wolverine taking a special interest in her and her rather broken and stunted socialization. When he brings her a doll to play with and sits to eat with her his frame of mind is very clear. Set up- Cyclops and Wolverine have been best buds ever since Cyclops forged the mutant race into a powerful independent nation. Utopia was literally forged and held together because of them. If Cyclops had anything to be done, executed or carried out Wolverine would just do it without question. This issue we see Wolverine not wanting the children involved in the imminent war. Art-Carlos Pacheco’s newer smoother less detailed style is visually pleasing. Cover- The all white cover was far too band to be worth the asking price and the cover which connects to later issues to form a cover was…..underwhelming. Lame- I’m sorry but I can’t help but chuckle looking at Kade Killgore…..this kid is now leader of the Hellfire club and the new big bad for the X-men? I’m not sold on that idea! Hypocrisy- So Idie is fourteen and should play with dolls and not be involved in battle at all so says Wolverine. In the same breath though wasn’t the x-men forged with Children being soldiers? The original X-men were teens when they started, child soldiers if we are going to be honest is the basis on which the X-men were founded. In addition Wolverine had two very young teens Jubilee and Kitty Pryde who he forged into warriors while following and being taken along by him. So he can create child soldiers he just doesn’t think the current children should follow in the footsteps of those who came before?